Time flies when you’re building a new app, and at week five, it was time for project retrospectives. Two short meetings to check in on what has gone well so far and what hasn’t. On Tuesday, the Gaslight team met to chat amongst themselves, and on Thursday, they had a second retrospective meeting that included the CRäKN team. It was a chance to honestly compare notes and do an all-team gut check. The main takeaways from the Gaslight-only retrospective: First, the team felt a need to improve the process for story mapping at the beginning of the project. It was a bit exhausting in hindsight and could use more structure. They also talked about ways to make early technology deployment, especially for Ember.js, faster. Finally, it was clear that Gaslight’s client onboarding process needs some work. In fact, CRäKN echoed that last point at the second retrospective. “I showed up at Gaslight with my dorky little backpack like a new kid on a college campus,” says CRäKN Chief Technology Officer Cliff Campbell. “Where do I sit?” Gaslight designer Lauren Woodrick remembers scrambling to find extra desks and chairs during that first day of co-locating. Everyone talked about the need for an orientation playbook for new clients with a checklist—where do I go, what do I do, etc. Another pain point? User story sizing. It’s hard to break down the app into easily buildable chunks. The team made design mock-ups, for instance, that encompass four or five different software features in the app. So there’s been some confusion about whether the team is working from design mock-ups or Kanban cards that define smaller software features. Right now it’s both, so it’s not as easy as everyone would like to track progress. CRäKN product owner Shawna Becknell also felt some pain around the user story map for the entire application. After using a digital tool, she became frustrated with its limitations. “The map was way too big, and I couldn’t see it all,” she says. “How could I properly plan the release if I couldn’t see the whole picture? I like analog, so I just put the whole thing on the wall.” Picture dozens of Post-it notes on the wall near the CRäKN team that outline the big picture vision for the app. This exercise gave Shawna additional insight into the build. While writing out all those user stories by hand, she found herself writing the word calendar about six different times. It made her realize just how important that functionality is to different parts of the app. 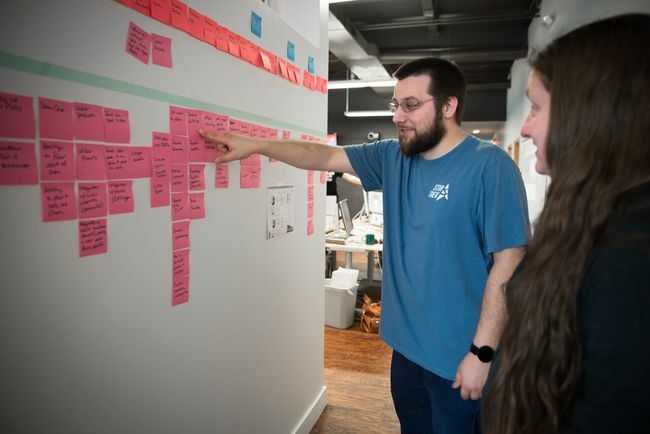 In addition to this analog story map, the team manages work-in-progress with Trello, a piece of project management software everyone can access. In week 6, find out what happened when real users tried out CRäKN for the very first time.